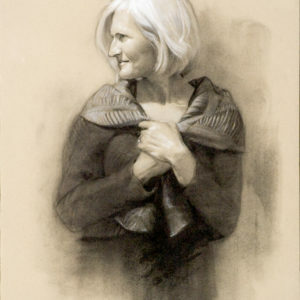 Images of the human figure, and portraits in particular, are the focus of Ernie Norcia’s work. Each portrait painting is designed to reveal the vitality of the subject, as well as aspects of their humanity. Ernie’s approach to painting is the result of years of study in the distinguished traditions of European and American painting. Artists such as Titian, Velazquez, Degas, and Sargent are his personal favorites as well as significant sources of inspiration. His portraits, whether formal or informal, destined for a boardroom or a private residence, display the spirit of his subject. Ernie’s paintings are done in oil using the finest materials, and occasionally in handmade classic tempera. He is a master of traditional methods in a contemporary world, using strong drawing as the underpinning of each portrait. Ernie works with the belief that well-crafted, archival images have lasting impact on viewers, leaving a legacy for future generations. Ernie Norcia’s paintings can be found in corporations, hospitals, and universities as well and numerous private collections in the United States. His various awards include those from prestigious art organizations in New York City to the Portrait Society of America to an Emmy. Originally from Connecticut, Ernie graduated from the Rhode Island School of Design. His studies included an academic year in Italy. Ernie continued his training at the Maryland Institute College of Art, where he received his Masters Degree in Painting. A resident of the Philadelphia area, he teaches a selected number of private students and conducts painting workshops as well as tending to his ongoing private commissions for clients around the country.